Think: mouthwatering Adobo and an appetite for friendly fun. The Datu Puti Adobo Movement is cooking up an exciting lineup of challenges and events to support its thrust to get Adobo its due accolade. Part of this gastronomic lineup of events is the Adobo Challenge, Datu Puti’s search for the best version of the Adobo among a lineup of budding food entrepreneurs. The Datu Puti Adobo Challenge represents the next phase in the Datu Puti Adobo Movement. After the warm response to the advocacy in 2015, 2016’s Datu Puti Adobo Challenge is poised to drive more enthusiasm and sustain support for the cult fave dish. More specifically, the Datu Puti Adobo Challenge dares Mercato Centrale’s food vendors to stake their claim for the best Adobo dish in town. Mercato Centrale’s finest vendors will showcase their Adobo recipes at a gastronomic showdown at the Mercato Central Saturday market in Bonifacio Global City on June 11, the culmination of the Datu Puti Adobo Challenge. 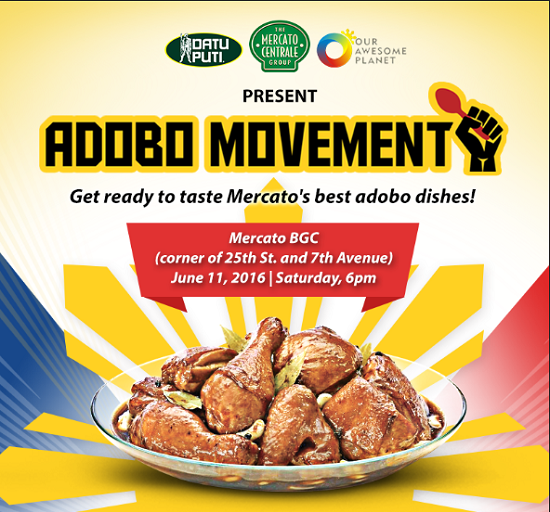 Join the Movement on June 11 and enjoy the taste fest during the Datu Puti Adobo Challenge. Rate sheets will be tallied based on the sampling served to a select pool of judges. Then, at the end of the Datu Puti Adobo Challenge, three winners will be declared, taking into the account the flavor, story, and heart behind their Adobo masterpieces. In addition, a People’s Choice Award will also be given to the crowd favorite, based on the preferences of the foodies on site.